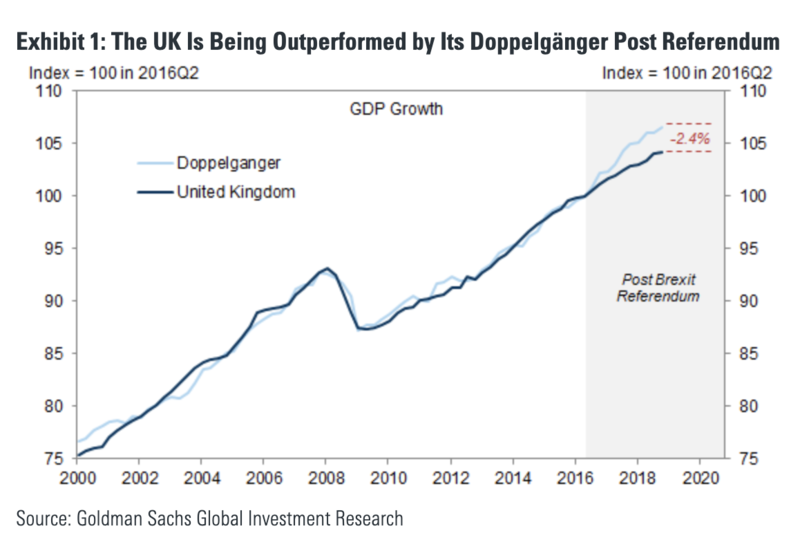 In his latest note published last week, SocGen's Albert Edwards - never at a loss subjects that inspire his outrage - rages on the topic of Brexit, and specifically the often repeated assertion (discussed here as well), that post-Brexit referendum UK has lost 2% of its GDP output, or about £800m a week. As Edwards further explains, "discovering my 10 year old son looking at Nasdaq share prices alerted me to the extent of the madness that had gripped the markets by end 1999. Similarly there are moments in this job when something you hadn't been following particularly closely is highlighted to you and you stagger back in shock. At that point you realise that something has gone very wrong." 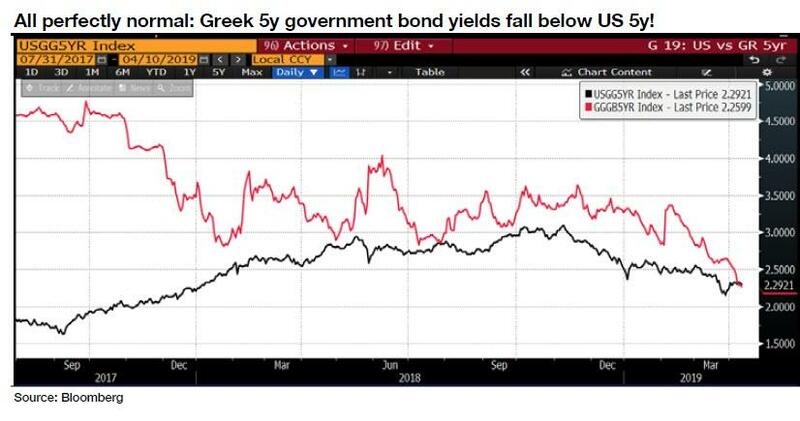 Aside from the shock of 5Y Greek govt bonds yielding below their US equivalents, there were a few more topics that "surprised" Edwards when he returned from his latest business trip to the US, the first of which is that while fears of a global hard landing receded at the start of last week in the wake of the bounce in the official NBS Chinese PMI back above 50.0 in March, even though most of the components of the official manufacturing PM rose, the important employment component fell further to 47.2 (see chart below). As Edwards points out, "this has now slumped below the levels that helped trigger the 2015 Renminbi devaluation! In addition despite recovering, non-manufacturing employment remains below the critical 50 level, meaning employment is still contracting." And as the SocGen strategist correctly notes, "at the end of the day, what matters to the Chinese Government far more than the GDP growth numbers most commentators focus on, is employment growth. For it is job losses, rather than whether GDP grows at 6% or 5%, that might be a prelude to social unrest." Besides the recent Chinese data, Edwards highlights the recent US Conference Board survey of CEO confidence as another "interesting datapoint" that was published while he was away. And while here, too, the headline measure ticked up a notch in Q1 to 43 from 42 in Q4 (a reading of more than 50 points reflects more positive than negative responses), the recent readings are consistent with an economy on the verge of recession and the manufacturing ISM at 45 rather than the current 55. There was one exception: "1998 Q4 which was a near death experience for the economy in the wake of the Asian/Russian/LTCM crises." And speaking of the risk of an imminent US recession, Edwards brings attention to the surge in the NY Fed's predictor of recession (based on the yield curve) which shows a latest reading of a 27% probability - the highest reading since 2008. However this probability underestimates the chances, as the series typically peaks out at a 40-50% probability, even in the depths of a deep recession (see dotted line on right-hand scale below). So recalibrating the scale on the chart so the probability is nearer to 100% in the depths of previous recessions, the probability of recession later this year jumps up to 60% rather than the reported 27% (see red line and left-hand scale below, Datastream shows forward data plots in the circle as faint red and dotted lines). Considering that in just two months, or June, the US expansion will become the longest economic up-cycle in history, Edwards points out that the fragility of the current economic situation is explained by this quote from former Fed Governor, Laurence Meyer: "A period of stability induces behavioural responses that erode margins of safety, reduce liquidity, raise cash flow commitments relative to income and profits, and raise the price of risky, relative to safe assets — all combining to weaken the ability of the economy to withstand even modest adverse shocks." He is, right of course, but as long as the Fed steps in every time there is an "adverse shock", why should traders, investors or anyone else for that matter, be nervous? Ainally, as Edwards promised at the start of his note, here is his Global Strategy "Weekly Failed as a Father", published in Nov 1999, at the highest of the dot com bubble. You’ve read about it in the papers. Child runs off with religious cult. It couldn’t happen to you of course. You understand your children. You’ve brought them up to know the difference between right and wrong. But when it happens to you, the soul-searching starts. Was it me? Did I spend too long at work? Should I have seen it coming? Or was it the little things? Perhaps I was nagging too much about his diabolical table manners. But it was only this Monday that I realised there was a problem at all. Anyway, I thought it a bit odd. I came downstairs at about 8am to pick up the Financial Times off the doorstep and the paper-boy only seemed to have delivered the supplement but not the main body of the paper. Odd! But the paper-boy had indeed been acting a little oddly recently. It was only the other day that he rang the door-bell at 6am. Rushing down and throwing open numerous bolts, I was confronted by a cowering boy who had, much to his horror, stuffed the wrong paper through the letter box and wanted it back. My sense of irritation quickly passed. He looked scared. Perhaps the shock of him seeing a grown man in Marks and Spencer paisley pyjamas was enough punishment. Anyway after finding only the supplement on the doorstep last Monday, I had assumed he was wreaking some sort of retaliatory action. I wandered into the kitchen - to seek out my caffeine intake – only to discover the awful, disgusting truth. On the kitchen sideboard I found the FT second section, open at the Nasdaq share prices. Then it hit me. My son – my little boy – had turned into a bull market junkie. He had sneaked down while I was asleep to check the Nasdaq share prices. Why? I suppose I wouldn’t have minded so much if he had been checking the Gilt pages or even the Building and Construction section – but why the Nasdaq? I should have realised the day before. He asked me to show him the Nasdaq stocks in the FT. I tried to shrug it off, as I did the recent one about transsexuals, but he persisted. Of course when I went to find it in the paper I couldn’t! I didn’t feel bad. I didn’t feel inadequate as a father. After all I had recently taken him to the park and repeatedly shown him how to do head on rugby tackles. I had the ball and was Jonah Lomu. He seemed to enjoy that! Surely that’s what modern fathers do! But apparently the boys are discussing the Nasdaq at school after having seen “those” adverts on television. Chancellor Gordon Brown better watch out. “New” Labour’ schmoozing of all that is American could potentially turn a whole generation of UK children into “growth” junkies. And this is how Edwards concludes: "Here we are in 2019 and looking at this chart, Im getting a strong sense of 1999 déjà vu!"